Then it turned into a 600+ word review, so I got rid of that intro. But I’m using it for this review, because damn, February was a stupid month to choose for this project. First, I would like to point out that if you are going to have a book take place in Britain, with characters from Britain, consisting of the letters that these British characters from Britain are writing to other British Britains, then you bloody well spell “honour” with a U, dammit! I’m not sure who is to blame for this, the publishers, the editors, or the authors, but come. on. As for the actual story itself? Well, I found it endearing. Of course, it was incredibly cutesy (like Stars Hollow on rainbows), and most of the main characters lacked any actual human flaws. Also, and this is a common problem in epistolary novels, most of the many different characters’ letters – male and female, old and young, educated/literary and not – read suspiciously like they were written by the exact same person. I’m sure developing a unique voice for 10+ original characters is a difficult job, but them’s the breaks if you choose to structure your novel through letter. 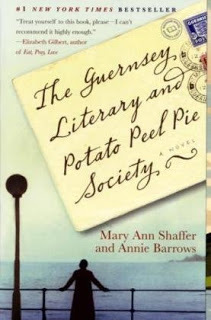 The Guernsey Literary and Potato Peel Pie Society reminded me of nothing so much as The Secret Garden – so, so sickeningly sweet, and everyone is ridiculously wonderful, but you don’t really care because sometimes people really can be like that, and it works. There’s room in the world for books like this (and room for books like The Big Sleep, equally). In short, hating this book is kind of like hating a litter of puppies. Most of the time, it’s just adorable and solves all the problems in the world, but every once in a while, if you’re feeling particularly bitter, all the cuteness might make you feel a bit…stabby.